Make the Jackson School part of your philanthropic plan. We invite you to make an annual gift to sustain our most immediate needs and challenges, create an endowment to direct your giving to a specific area now and in the future and plan your legacy with the Jackson School. All gifts make a difference. Foundation staff members are available to help you understand how your gifts make an impact and provide the most meaning for you and your family. Give generally or select a specific JSG endowment(s). JSG Dean and Foundation Director Sharon Mosher and Director of Development Belle German can offer overviews of various support options. Create a legacy through a planned gift. For more information contact Georgia Sanders. Get even more bang for your buck. Check out http://matchinggifts.com/utexas to learn if your company provides a match, or ask your HR rep. Consider Derek Sawyer, Ph.D. ’10, who valued his time at the Jackson School and wanted to make a contribution. “I wasn’t sure my small gift was going to make a difference. However, it was a no-brainer to donate when I found out a modest amount would be immediately doubled,” says Sawyer. Derek didn’t stop there. He accessed ExxonMobil’s 3:1 company match growing his gift exponentially. I am just one person – does my gift really make a difference? Great institutions rely not just on major gifts but on the dedicated participation and ongoing investment from thousands of stakeholders. High levels of engagement form alumni is often one of the key indicators of excellence for academic programs. Your decision to contribute to the Jackson School, at any financial amount, is vital to our long-term success. Additionally, combining your gift with your company’s corporate matching program can help to further stretch the impact of your investment. How are unrestricted dollars spent? At the Jackson School, we are fortunate to have a permanent endowment with revenues that allow us to “keep the lights on.” This provides us the unique opportunity to put unrestricted dollars to use in ways that truly benefit students and further advance cutting edge research. In recent years, Dean Mosher has utilized unrestricted annual gifts to meet critical needs more quickly. Examples include creating a Writer in Residence position to assist students with scientific writing and improving an outdated HVAC system to allow our labs to function at full capacity. 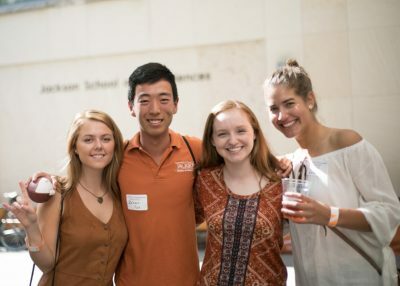 Endowments at The University of Texas at Austin are a sound investment in a better future. With an endowed gift, you provide permanent support for the University. Your gift is invested — never spent — and each year a distribution, like dividends on a mutual fund account, is made to your chosen program or area. Investment earnings above the dividend rate help the endowment value grow over time, to keep pace with inflation and maintain your endowment’s spending power. You may take up to five years to fund an endowment, and once it is officially established, you or anyone else may continue to add to its principal at any time. Moreover, by selecting the title of your endowment, you can forever link your name, or that of a family member, friend, or organization, to scholarly excellence at the University. The impact of endowments cannot be overstated. They provide long term support to achieve the visions and dreams of our students, faculty and research scientists. An endowment of $1MM provides approximately $45K in annual program support. We suggest consideration of higher endowment levels to assure that the impact of your philanthropy is effectively felt within the Jackson School. Like the leaders and supporters who have gone before, you can choose to develop a philanthropic plan that will ensure a secure future for the Jackson School and its students. By including the Jackson School in your retirement and estate planning you can diminish tax burdens while supporting students and faculty. Charitable gift annuities, which provide immediate fixed payments for life, with the remaining funds distributed to the Jackson School, offer one option. Or you may find it more attractive to do a charitable remainder trust that converts significant appreciated assets into cash payments while eliminating capital gains taxes. If created through your will, this is one of the best ways to roll over qualified retirement-plan assets to leave more for both your heirs and your charitable interests. For more information, please contact Belle German at 512-471-1993.